Traditional Irish music falls into two broad categories: the song tradition, which is most commonly unaccompanied solo signing, and dance music, consisting of lively reels, hornpipes, jigs and polkas. Within these two categories are many regional variations, similar to dialects of a language. The fiddle is a primary instrument in Irish music, providing the melody for many dance tunes. The instrument is the same as a violin, but is called a “fiddle” due to differences in technique and attitude. For example, a Mozart sonata is for the violin, while the popular jig “The Lark in the Morning” is for fiddle due to its rhythm, rolls and lilting notes. 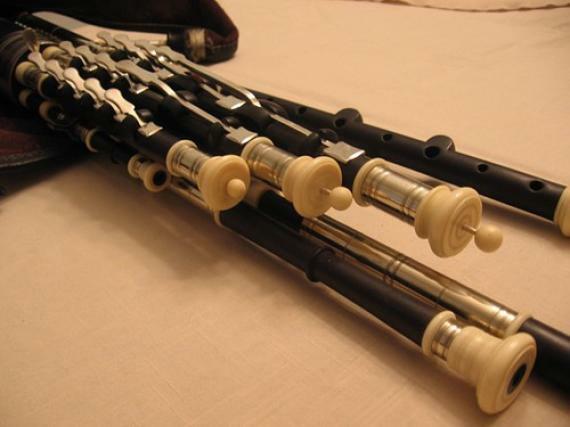 The Uilleann pipes are another common Irish sound, making music by blowing air through a bag filled by a bellows. The result is a wide range of notes with a sweet tone. Other common instruments used in Irish music include the flute, tin whistle, harp, concertina, button accordion and the bodhran, a one-sided goatskin drum. One of the most popular Irish songs, “Danny Boy,” is actually a combination of English lyrics and an old Irish air from the county of Londonderry, now in Northern Ireland. The original lyrics are open to interpretation, but many believe the song is a parental message to a son heading off to war or leaving the country as a member of the Irish diaspora.